SAN DIEGO, Calif. -- Riverwalk Golf Club is like a timeline in the history of Mission Valley, a wide river valley floodplain that feeds into the Pacific Ocean. Don't miss the view from the 178-yard second hole on Riverwalk Golf Club's Presidio nine. A collaborative effort by Ted Robinson Sr. and his son has resulted in a most scenic championship layout. 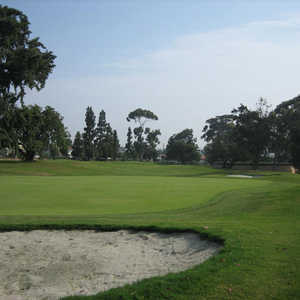 The championship 18 meanders through mature eucalyptus trees, tall palms, and majestic oaks. Sparkling ponds contrast with the dozens of white sand bunkers and the emerald green, Bermuda grass fairways. Built along an agricultural greenbelt of the San Diego River that sustained crops and dairy farms, the area where Riverwalk G.C. emerged exploded with development when Interstate 8 was completed. Hotels, malls and businesses sprang up -- even Qualcomm Stadium is just minutes away. The course was originally known as Mission Valley Country Club and it hosted the San Diego Open Invitational (a forerunner of the Farmers Insurance Open, now played at Torrey Pines South) from 1957-61, crowning Arnold Palmer as champion twice. In 1962 it was renamed Stardust Country Club. The course hosted several more pro events won by legends such as Gary Player (1963) and Billy Casper (1966). Old-timers will tell you Phil Mickelson worked at the Stardust practice area in the mid-1980s picking up range balls. 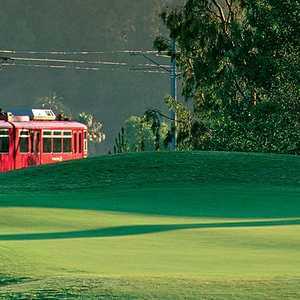 The construction of the San Diego Trolley in the 1990s forced a complete redesign, and Riverwalk Golf Club was born as a 27-hole Ted Robinson Sr. and Jr. design. The nines were named Presidio, Mission and Friars (all par 36s ranging from 3,153 to 3,397 yards). It opened to public play in March 1998. If you know the Robinson style, the new Riverwalk included more undulations, water hazards, a better drainage system, upgraded landscaping and a worthy clubhouse. The old track was flat as it bounced over the river numerous times. Water is in play on 13 of the 27 holes. There's no guessing what the signature hole is -- and it is in view of the interstate and side street (Fashion Valley). The Mission Course's third hole is a beauty, 304 yards, with water almost tee to green. Aim left toward the bunkers down the dogleg right border and you will have a wedge to a green surrounded by rolling waters and a waterfall surrounded by flowers. The Presidio nine has two par threes, the second and eighth holes, with water carries. No. 2 is 178 yards over a pond and no. 8 is 148 yards over the river. Riverwalk Golf Club has experienced high water including this year and 1998 and that can make it a challenge to keep fairways in top shape. The poa annua greens, however, are remarkable, fast and true. "We get many positive comments about the greens," said Brendan Cronin, general manager. "As busy as we are lots of golfers can't believe how good they are. Also, with three nines our customers enjoy the variety, the friendly staff, the dual-sided, large range, the central location and the food and beverage options in the restaurant." Just across the street from Riverwalk is Town and Country Resort and Conference Center. Built in 1953 on 40 acres, this is truly a walk back in time. Explore the property and you will find high rise (two towers) rooms and suites that included the penthouse suite I stayed in. But it also includes single-story rooms, parts of its original 46-room motor inn that opened surrounded by a horse ranch and open farmland. In the 1950s founder Charles Brown saw San Diego becoming a world-wide tourist destination. He was also the first to put coffee dispensers in guest rooms. Town and Country, however, is on the verge of an $80 million renovation set for the next two and a half years. Today's resort includes an awesome BBQ restaurant, Charlie's, plus the Terrace Cafe for breakfast, lunch and dinner. Three swimming pools, an award-winning rose garden, numerous fountains and outdoor seating areas make Town and Country a winner. For more information, call (619) 291-7131 or visit towncountry.com.